A 50-year-old man was surprised to find out that a worm has been living in his head for four years. 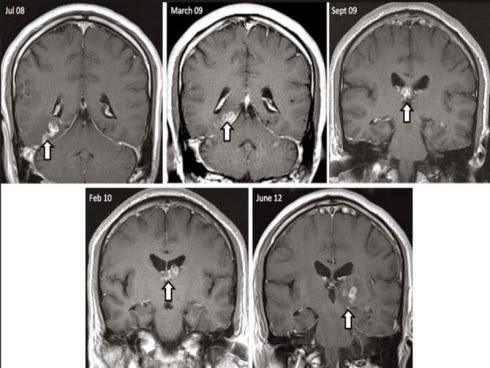 The presence of parasites identified as tapeworms was only detected after scientists from St. Thomas Hospital in London took a biopsy of the top of his brain. According to what he said, he has gone to the hospital often since 2008 after experiencing memory loss and excessive headaches. "I often complained of pain on the right side of my head. I can't remember some past events and my sense of smell seems to have changed. "I've been checked for HIV, syphilis, and dry cough, but all the results were negative," he said as quoted by the Metro site. Expert Medical later performed surgery to remove these parasites from his brain. According to the surgeon, during these procedures, tapeworms 1 cm long were moving 5cm to the right portion of the brain, making the surgery procedure more difficult than the doctor expected. During surgery, the surgeon also reported finding some worm eggs in his brain. According to the chief scientists at the Welcome Trust Sanger Institute, Dr. Hayley Bennett, tapeworm type Spirometra erinaceieuropaei is a rare parasite species. He said the species has only been reported 300 times in the past 60 years. "This type of tapeworm is very rarely encountered, but it is most common in Southeast Asia, China and Japan. "Patients are exposed to this type of parasite by eating contaminated food or through the materials used in Chinese Medicine for sore eyes, including raw frogs," he said. According to doctors, the victim is from a Chinese family and lived in the UK for 20 years, but he frequently visited China.